A FEW DAYS AGO, MY FAMILY AND I TOURED FRANK LLOYD WRIGHT'S Pope-Leighey House in Alexandria, Va., and the visit put in sharp relief the contrast between how we live today and how many Americans lived a couple of generations ago. Not that this house, built in 1939, was especially typical of its time. 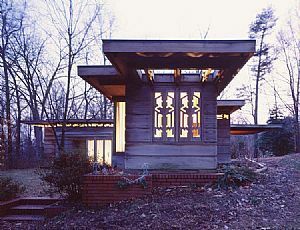 Many of the innovations Wright included in the house -- such as its long, horizontal lines that transcended interior-exterior walls, simple building materials, furniture designed for the house, the dining room and living room sharing essentially the same space -- probably stuck out pretty noticeably in a neighborhood of small Georgian-style homes. There's scarcely enough room in the bedrooms to do anything more than get out of bed and dress. Bedrooms, Wright believed, were for sleeping. Once you performed that function of life, your obligation was to spend time in common rooms with your family or outside with nature, which figures prominently in nearly every Wright design. Wright's covered his walls, interior and exterior, with Florida cypress paneling, and he discouraged the hanging of pictures or other ornamental items that might disturb the organic atmosphere he was trying to create. He also made sure there were book shelves built into every room (except the bathroom, where you should only spend as much time as it take to, well, you know), as he favored reading. But different as it was in design and as a social experiment, methinks the house was not such a radical departure from others in its neighborhood and others around America's cities, suburbs and rural areas at the time. You don't have to have a degree in urban planning (which I do) to see that most of the houses built well before World War II, and even many others shortly after, did not give their owners the kinds of space and amenities that were common to every new house built after, say, 1960. My own house, built in the mid-1920s, is a bungalow that originally had two small bedrooms, and perhaps a third if you winterized a back porch. Needless to say, there was only one bathroom. The kitchen was very simple. Closet space? Forget about it, though there was a basement and attic. Many of the Georgians and Federal-style homes in the Washington area where I live are also tiny, compared to today's standards, most with only one bathroom on the second floor (a major hassle for families with young kids or elderly who cannot get up and down the steps easily). What that tells me is not that the people who lived in those houses were doomed to daily misery; in fact, they were probably very happy to live in what was considered nice accommodations for the average middle-class family. No, what it says is that we, of this generation, have grown up expecting much more -- and in some people's cases, much much more -- than our forebears did, and probably a lot more than we actually need. I personally can't understand how the early owners of my house raised families as large as, an perhaps even larger than mine. We added on to the house (it's still not huge, but it feels more functional than before) just because we felt it would be a hardship to squeeze so many of us into it. But that was just what people of earlier generations came to accept. Today, so many are building homes that make sense only for families of 8 or maybe even 12, even if they only have a couple or no kids. And they feel they can't live without many gadgets and furnishings. (So as not to offend any friends, I won't mention any specific item, but you know what I'm talking about.) They don't see these items as luxuries, which would be one thing, bur rather as necessities. I'm no Luddite, and I'm not saying we should do without central air conditioning (I would die), garbage disposals (can't think of living without one), electric dishwashers (I could live without it, but it is nice) or cable TV. But, not to sound smug, but I also like having just enough space, which I do at roughly 2,400 square feet, and I don't miss a lot of the high-end amenities I see elsewhere. I'm mostly thinking of the size of many houses I see these days, which are really big, some of them. They make you wonder about the cost of heating and cooling, as well as the maintenance and, of course, all the stuff people buy to fill up that space. I also don't understand the need in many homes to put a TV -- and big ones! -- everywhere. I watch a fair amount of TV, but I don't need it everywhere I turn. There's no question that Wright's Usonian ideal was just that: something that sounded attractive to some in principle but was probably hard to achieve on a practical level (though some of the Usonian elements made their way into widespread home architecture, especially after the war). But what's noticeable is how far we Americans are today from that ideal and from a simpler and more frugal standard of living most of our parents and grandparents experienced -- and survived -- not so long ago. IT HAS TAKEN ME A FEW DAYS TO GET TO WRITING ABOUT BARACK OBAMA’S race relations speech the other day, which some are calling one of the greatest political speeches of all time and others are shooting down as a rhetorical sleight of hand. My delay has to do in part with my busy life and in part with my ambivalence about it. Let’s start with the simple stuff: Contrary to much of the swooning that’s going on around Obama’s speech, there’s nothing terribly original about a politician addressing the subject of race. It may have been a great speech, as speeches go, but others have tread this ground much more than Obama has in this campaign. Bill Clinton deserves a lot of credit, for example, for tackling it through his Presidential Commission on Race. Many more cynically minded people never gave the Commission a chance to succeed. Yes, it’s true, it did bog down a bit in side arguments about whether one group’s victimization was greater than others. But it was a good try, and Clinton waded into the subject quite often when his advisors strenuously urged him not to, fearing it would get him into trouble. I think the nation is better for his doing it, but certainly not entirely reconciled with the issue of race. Certainly, the subject of race was much more of a front-burner issue during the 1960s through the ‘90s than it has been in the last eight years from some reason. Up to the late 1990s, it was a subject about which there was a lot of great writing and speech making (and a lot of silly, noisy rhetoric, too). I know, because in those days I read everything I could on those subjects. Somehow, there seems to be far less talk about race these days, which is surprising given that the Bush Administration has done precious little to advance the discussion for the better or the worse. Or maybe it's because of it. Obama’s speech, while noteworthy for opening the subject at all, doesn’t even approach the kind of candid and smart talk I heard up to about eight years ago. It simply reminds people that we have to get back to the talk about it. That's admirable but not epic, as many are portraying his speech. Most importantly, I’m ambivalent about whether Obama should get a pass, as many are granting him, for indulging the Rev. Jeremiah Wright. I feel a bit like Obama tried to have it both ways when he condemned the words but not the man who delivered them. To me, that’s essentially an endorsement of the words, and it undermines the decency of many African Americans – and I know of many – who would simply have found another church if their pastor had acted this way. But he has a point that what Wright said is a common theme in the black community - doesn't make it right, but there's something in it for all of us to learn from. Like Obama’s speech itself, there’s nothing all that new about Wright’s comments. Anyone who has listened to African American radio or read African American newspapers will be familiar with this kind of stuff. Hurtful and potentially dangerous as it can be, whites who are surprised by such sentiment have simply not been paying attention, assuming, I guess, that we’ve ‘gotten past’ all our racial problems – which is itself a reason for African Americans to be frustrated. I think it’s delusional and dangerous to say some of the things Wright said: that whites are responsible for giving blacks the AIDS virus or that we somehow sowed the seeds of the 9/11 attacks by our previous behaviors, and so on (I've heard much worse). I have long been annoyed and angered by so many African Americans’ unwillingness to distance themselves from this sort of crap. Still, while the content of speeches like Wright’s may be beyond the pale, that doesn’t mean we should ignore the spirit or the intent of those speeches. There’s something driving it that is telling us that, while we’ve come a long way in a generation or so since Jim Crow, African America is not at all feeling that the journey is over. Many admirable legislative and private-sector initiatives have been put in place to ameliorate the legacy of racism, but there is still much to be despondent about, and the real debate is about whether that’s because of residual white racism. Yes, it’s good that Obama took a chance, and it’s good to see that the reaction was, for the most part, thoughtful and possibly constructive. I don’t think he’s fully extricated himself from the tight spot that prompted his great speech in the first place, and I'm annoyed with everyone from assuming that he has. Nor did he plow any especially original ground, a so many have suggested he has. But he's on to something. I hope it’s not the last we’ll hear from him on the subject.